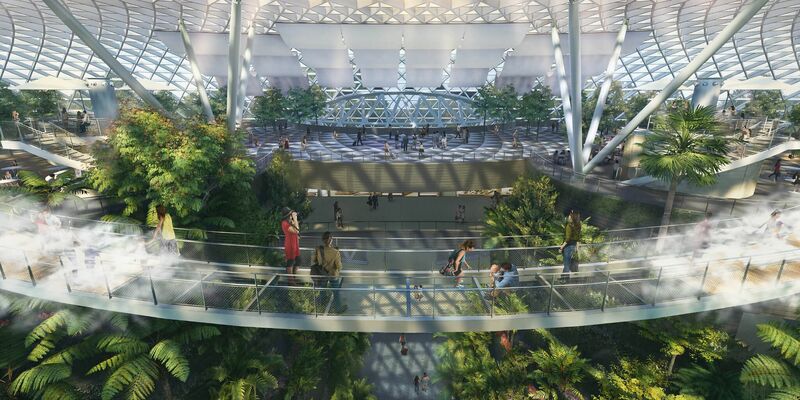 SINGAPORE - Jewel Changi Airport, a 10-storey development in front of Terminal 1, will go beyond just being another commercial development with retail and food and beverage outlets. A key feature will be a 14,000 sq m Canopy Park - about the size of 11 Olympic-sized swimming pools - sitting on the top floor of the dome-shaped structure. 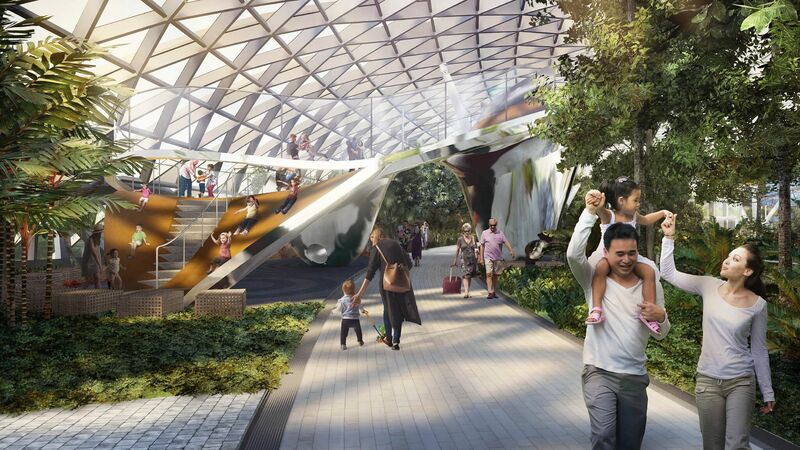 On Wednesday (June 7), Jewel Changi Airport (Jewel), a joint venture between Changi Airport Group and CapitaLand Mall Asia, gave a glimpse of what travellers and visitors can expect when it is ready in early 2019. Designed by world renowned architect Moshe Safdie, Jewel will feature a distinctive dome-shaped facade made of glass and steel. 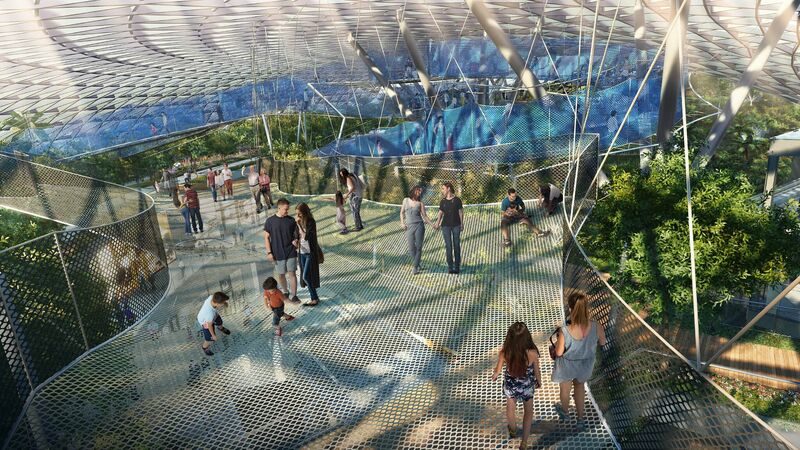 A 250m bouncing net, which at its highest point will be suspended 8m or three storeys above ground, will offer visitors a unique experience. A separate walking net, 50m-long and 25m-high, will offer a different kind of thrill, allowing visitors to peek through the voids. Designed by Adrian Fisher, founder and chairman of Adrian FisherDesign, who has created over 600 mazes - the largest number of mazes globally. 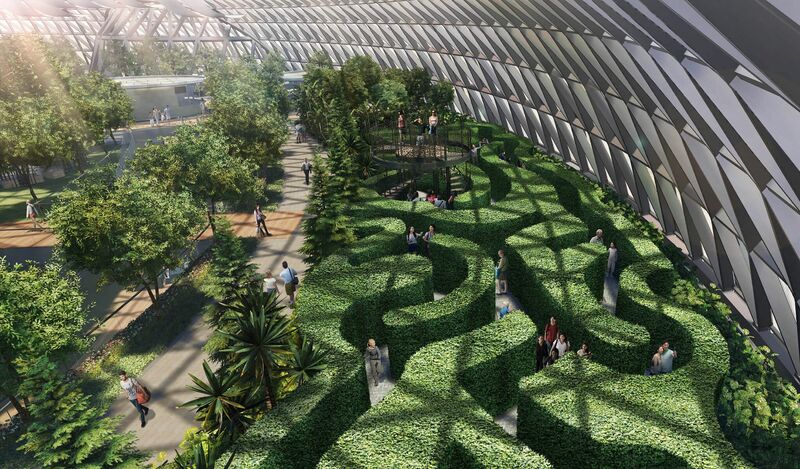 One of the mazes at Jewel will be Singapore's largest hedge maze with hedge walls standing at 1.8m high. Another highlight is the first mirror maze designed for an outdoor park environment. The mirrors will create illusions to challenge and confuse visitors. Both mazes cover an area of over 500 sq m and there will be a lookout tower for visitors to have a bird's eye view. Designed by Carve in the Netherlands and built by Playpoint (Singapore), the slides are an art sculpture as a play piece. It will be the first large-scale sculptural art piece in Singapore made up of four integrated slides - two tube slides and two sliding surfaces - of varying heights to provide children and the young-at-heart with hours of sliding fun. 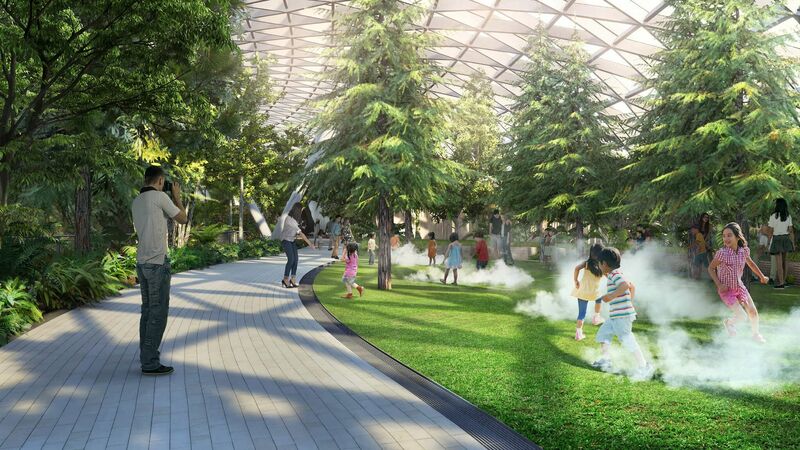 The Forest Valley, a five-storey garden, will house one of the largest indoor collections of plants in Singapore. 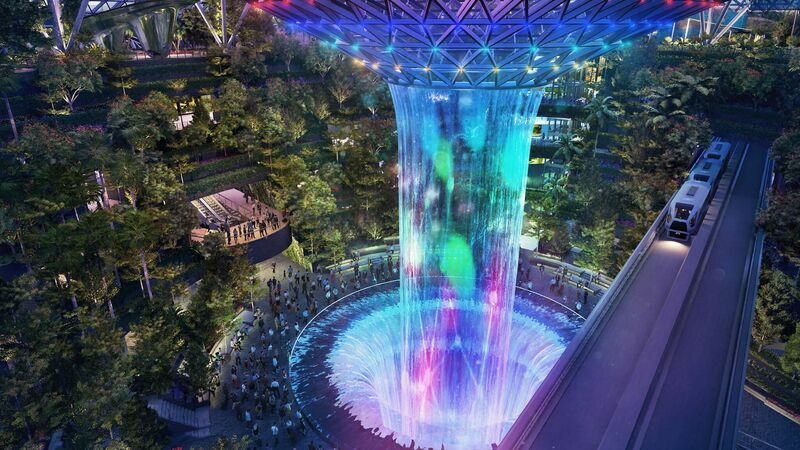 Jewel will also feature a 40m-high Rain Vortex, that is expected to be the world's tallest indoor waterfall. It will be located at the core of the complex and will transform into a light and sound show with special lighting effects at night. Designed by The Exploratorium, in San Francisco, the key feature of this attraction is four gentle concave bowls with depths of between 30cm and 65cm, for young children to jump in while mist is released to create an illusion of playing among clouds. The bridge, suspended 23m above ground and at 50m long, will have glass flooring in the centre section. Visitors can walk along the bridge surrounded by mist. It will offer the best vantage point to view the Rain Vortex display.